Muckross coach Sarah Scott says her young side are "starting to realise their potential" following a big 3-0 win over Old Alex in the Irish Senior Cup second round. It has been a long road back for the Donnybrook outfit from their glory days, reaching this competition's final six times in the 1990s. Since then, they have dropped right the way down to Leinster Division Four and back again, earning promotion to the all-Ireland EY Hockey League this term for the first time. But while other sides recruit heavily on promotion, Scott kept faith with the youth section players that served them well and they finally got their first win of the campaign against an EYHL side. Laura Hanlon set them on their way with a corner rebound before youth internationals Niamh Gowing and Yasmin Pratt also weighed in. It was quite the turnaround from their 5-1 loss to the same opponent in October and Scott says it brings a huge lift for the second half of the season. "It was a deserved win to finish the first half of the season; this team has really grown up in the last few months," she said. Elsewhere, the draw went largely to script with UCD hammering Lurgan 6-0, Pegasus beating Trinity 5-2; Cork Harlequins thumped Banbridge 5-0 and Pembroke out-did Monkstown 4-0. Loreto were tested at Ballymoney but second-half goals from Sarah Evans and Christina Hamill saw off the Antrim side, for whom Olivia Mullan - younger sister of Irish captain Katie - was on the mark. 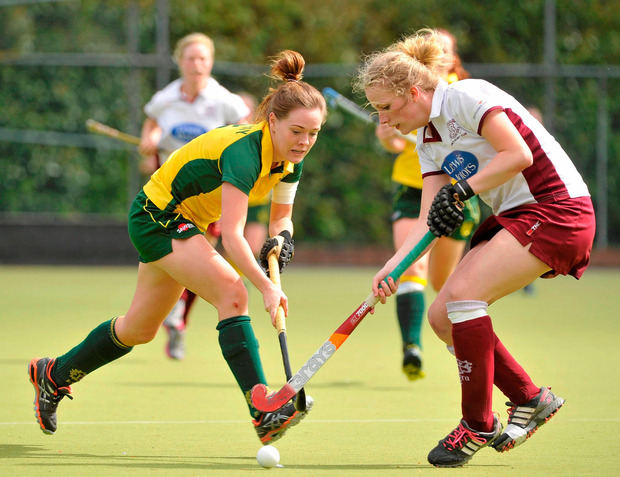 Railway were also pushed hard by the Ulster Elks, for whom Megan Frazer scored in the first half. Zara Delany (pictured), Orla Fox and Kate McKenna, though, combined to turn things the Sandymount side's way. On the men's side, Ryan Burgess ensured it will be a long winter break for Cork C of I as he fired home a last-second winner for Annadale at Garryduff in a 3-2 win in an EY Hockey League refix. Stephen Findlater Pegasus eased to the women's EY Hockey League title with a 6-0 win over bottom side Muckross giving them the point they needed.